The ship model has been built with sails set like the ship being on port tack in quartering wind. The small stabilizing wedges by the keel give the model a slight listing to lee. One can easily get the impression of an elegant ship moving in the wind. Please take your time to have a good look at the set of photos. There are several views of the entire model and close views on hull and rigging. 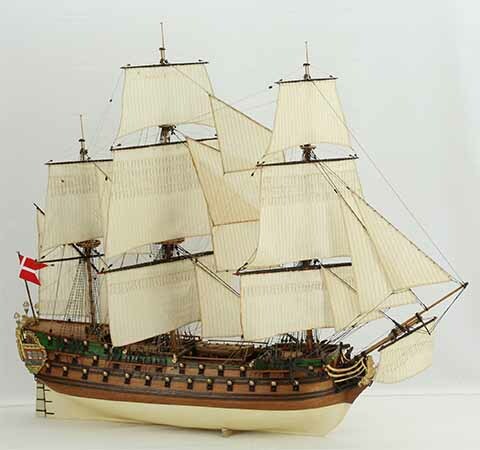 The beautiful, very well done model of the NORSKE LOEVE is 1 : 75 scale. Length is 102 cm, width 35 cm, height 92 cm. The model can taken out of the stand, e.g. for transport. Click images to enlarge!